That is the verdict of F1 expert Tony Jardine, who expects Mercedes chief Toto Wolff to replace Bottas with Esteban Ocon. Lewis Hamilton is gearing up for his seventh campaign with Mercedes having joined the Brackley-based team from McLaren in 2013. And this year he will be desperate to move one step closer to the legendary Michael Schumacher by winning a sixth F1 title. Hamilton went level with Juan Manuel Fangio on five World Drivers’ Championships in 2018, thanks in part to the exploits of Bottas. The Finn followed Mercedes team orders to help Hamilton on a number of occasions last season after it became clear he was not in title contention. Bottas has finished third and fifth respectively in his two campaigns since moving to Mercedes from Williams. And a title tilt looks unlikely this year, with Ferrari’s Sebastian Vettel and Red Bull’s Max Verstappen the biggest threats to Hamilton’s hopes. 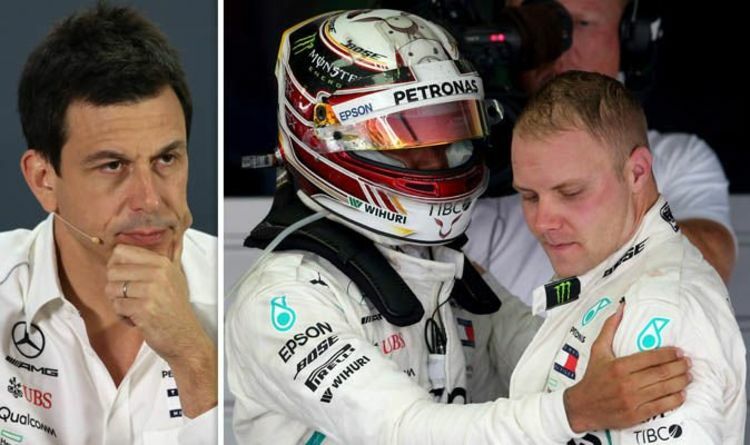 Jardine, who worked with Goodyear, Brabham, McLaren and Lotus in F1 and is now a motorsport pundit, has given a damning take on Bottas’ performances for Mercedes. And he has named Mercedes development programme product Ocon as the driver most likely to replace Valtteri Bottas if Wolff decides the 29-year-old’s time is up. “Mercedes have got some great young drivers,” Jardine exclusively told Express Sport, when asked about potential future team-mates for Hamilton following his sixth F1 title win. “You’ve got Esteban Ocon sitting there, who was kept out of a drive by other teams because of his Mercedes connections, that’s why he hasn’t got a ride for next year. “But, for me, Bottas has been very disappointing. I can’t see him going for any longer than 2019 with Mercedes. “He just has not delivered. He’s very smooth, he’s very fast, on certain circuits like in Sochi in Russia he’s very, very quick. “But even he has come out now and said: ‘I’ve got to come out fighting [in 2019], got to be more aggressive’. But it’s too late in my book. “It’s interesting that he’s trying to keep his profile very high because he’s just announced that he’s going to do the Arctic Lapland Rally, which is the big snow and ice rally in the Arctic tundra. “[That is] because the car’s dancing around all the time. They go and practice on the frozen lakes and all that other stuff, it’s fantastic for car control. “Most of them have done it. Carlos Sainz Jr, obviously his dad told him to do it because he was an ex-rally champion. That’s where they hone their skills. Hamilton and Bottas will get their third season as team-mates underway on March 17 when the Australian Grand Prix takes place in Melbourne. Tony Jardine spoke to Express Sport on behalf of beIN Sports. beIN Sports will broadcast live coverage of the entire 2019 F1 season.